This gadget is like a mini lab kit for testing your food. Cutting gluten out of your diet isn’t easy. There are obvious culprits, like bread and beer, then there are sneaky foods like dishes made with soy sauce and imitation crab. How can a person be certain that a food won’t make them sick? San Francisco-based startup 6SensorLabs has developed a portable gluten sensor called Nima, which I saw in action at a gluten-free happy hour during South by Southwest Interactive. The happy hour spread was laden with foods that 6SensorLabs knew for certain were gluten-free, but there was a side table with a few dishes that were iffy, like fried chicken. Fried foods can be gluten-free, depending on the batter, so 6SensorLabs CEO Shirene Yates showed me how to use the Nima to see if the chicken was safe for celiacs to eat. Think of Nima is a mini lab kit. You take a small sample of food about the size of a fingernail and place it inside a disposable capsule with a built-in antibody strip. Snap the capsule into Nima, which is a reusable triangular black device, and give the strip up to two minutes to look for the gluten protein. The device can sense 20 parts per million of gluten and alert you with a happy face or sad face on its display, or push a notification to your phone when the test is done. Not surprisingly, the fried chicken was full of gluten. Yates, who hasn’t eaten gluten in years, said she envisioned the device for use in restaurants, where there’s more uncertainty about ingredients and preparation. “People who have food sensitivities are worried to go out and eat and be social,” she said. The Nima app will become sort of like a gluten-free Yelp, where people can log dishes they've tested to mark them safe to eat or warn others to stay away. 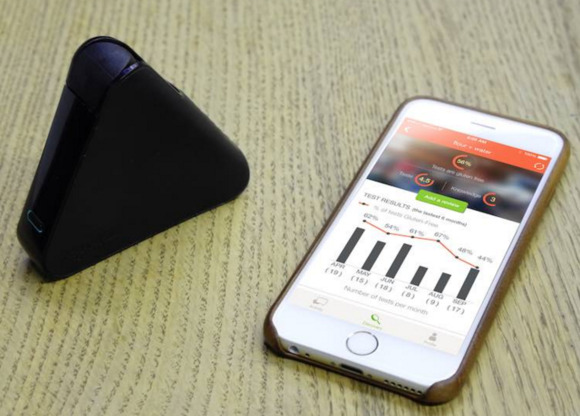 In beta testing, 6SensorLabs found that many people use Nima to test pantry items that aren’t specifically labeled gluten-free just to make sure they made the right choice. You can preorder the Nima now for $199 and it will be available to purchase this summer for $249. The device comes with three disposable capsules. You can buy more capsules in packs of 12 for the subscription price of $48 per pack.